The year-2008. The place-Augsburg, Bavaria. The band-Arising Fear. The style-metalcore/thrash. That is the when, where, who and what of the equation that is t the heart of this German four piece band. And yet it still leaves a lot of questions remaining doesn't it? For one thing the actual players are Alex Rauh (vocals/guitar) , Kevin Pöllmann (guitar/vocals), Tom Franz (bass) and Tobi Möhring (drums). And the style? Well, it's a bit more complex then all of that, as it's the old throw everything in (heavy meal, thrash metal, metalcore, groove metal) and see what sticks, and yet it's simpler then all of those different elements would suggest. Up front I'll say that this LP was a long time coming for me, waiting and waiting and more waiting, and I had hoped to have a physical copy on hand instead of relying on MP3s (it just makes life all the more easier when you have a actual CD copy to go by-just an FYI for future submissions) so I can't comment much on lyrics and such. It is what it is. The music on the other hand can be discussed so, the pros and cons. Pros would be attitude (aggressive, to the point outlook/mentality), technical ability and the realization that Arising Fear are on to something with their actual music! 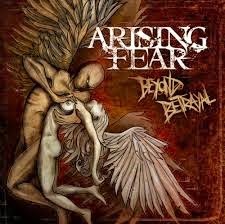 The four guys involved with Arising Fear offer up a semi-unique take on modern thrash and when they are on the material really CRANKS! The cons though, or really just con, would be the need for a wee bit more consistency (some tracks were really cool and then there were occasions where I just wondered if I was missing something) from start to finish. As this is the band's first full-length (a 2009 self-titled EP served as a precursor to "Beyond Betrayal") and they are still working out some of the kinks the lack of consistency can be excused. The best bet to take on Arising Fear would be that by album number three (possible two, but let's say three to be on the safe side) these four will be whipping out "drop the hammer"-style metal that will balance out the band's aggressive attitude and technical know-how. For now this one is good, not average or great, thrash metal/metalcore with signs of future promise for those with patience.